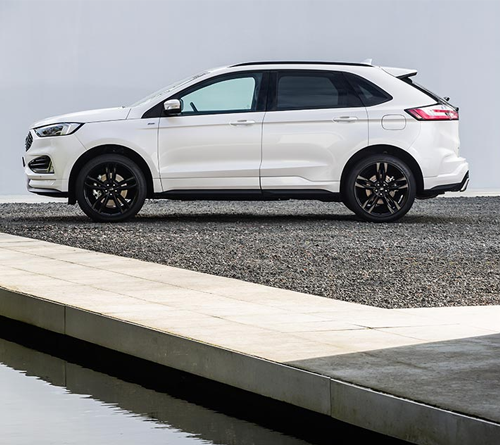 The new Ford Edge debuts a new powerful and fuel-efficient bi-turbo variant of Ford’s 2.0 litre EcoBlue diesel engine, combined with a new eight-speed automatic transmission for effortless cruising, and Ford Intelligent All Wheel Drive for optimized traction. 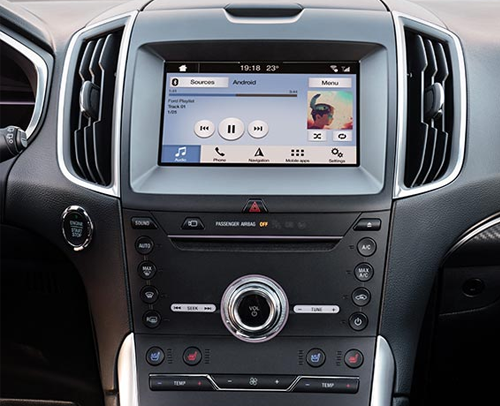 Unveiled in sporty ST-Line specification, the new Ford Edge makes a statement with enhanced exterior styling, and offers a premium comfort specification including wireless charging for mobile devices, Ford’s SYNC 3 communications and entertainment system, and a 1000 watt B&O PLAY audio system. Post-Collision Braking helps to reduce the impact of a potential secondary collision by automatically applying moderate brake pressure when an initial collision event is detected; slowing the vehicle can potentially lessen injury to occupants and further damage to the vehicle. Evasive Steering Assist helps drivers steer around stopped or slower vehicles to help avoid collisions. Designed to operate at city and motorway speeds, it uses radar and a camera to detect slower-moving and stationary vehicles ahead and provides steering support to enable drivers to manoeuvre around a vehicle if a collision is imminent. Adaptive Cruise Control with Stop-and-Go and Lane Centring Assist helps the vehicle maintain a comfortable driving distance from vehicles ahead and helps reduce stress during long, light-traffic road trips by helping keep the vehicle centred in its lane. 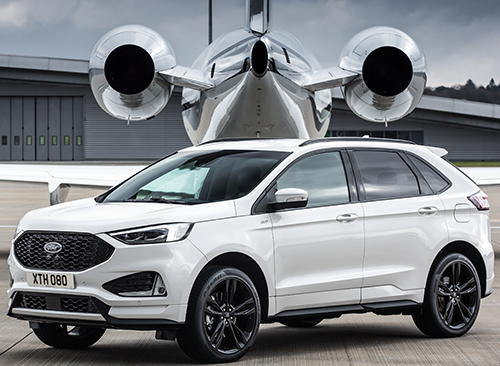 The new Ford Edge uses the latest powertrain technologies to deliver effortless performance alongside optimised fuel-efficiency and CO2 emissions. Ford’s new 2.0-litre EcoBlue bi-turbo diesel engine delivers the power, torque and performance alongside fuel-efficiency and low CO2 . The advanced bi-turbocharging system retains the advanced fuel-injection technology and low-friction EcoBlue architecture to help meet stringent Euro stage 6 emissions standards. 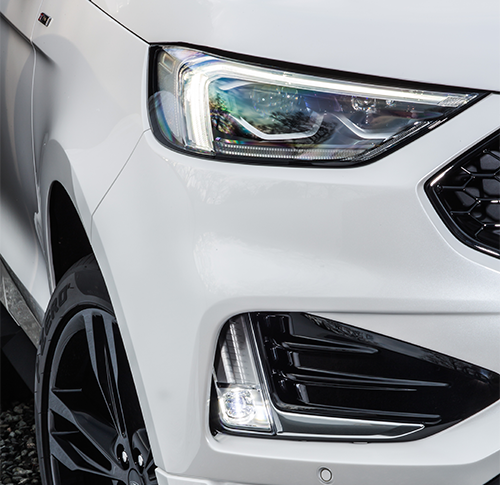 With sports-tuned suspension to further enhances the new Ford Edge ST-Line driving experience, supported by Ford Adaptive Steering technology, which optimists the steering response and makes the new Edge easier to manoeuvre by continually changing the steering ratio according to vehicle speed, and wheel-mounted shift paddles for the eight-speed quick shift automatic transmission. The new Edge ST-Line features bold and dynamic exterior and interior styling that includes: body coloured lower door, wing and body side mouldings, and a front upper grille with a unique black finish for the horizontal bars and surround; Standard 20-inch, and optional 21-inch, premium, painted aluminium wheels; Dual exhausts featuring chrome finished tips; Perforated leather steering wheel, and gearknob featuring red stitching for manual gearbox models; Aluminium sports pedals, a black headliner and premium velour floor mats. An available wireless charging pad enables cable-free charging, and SYNC 3 communications system enables drivers to control connected smartphones, audio, navigation and climate using voice commands and an 8-inch colour touchscreen. The new B&O PLAY sound system has been specially tuned for Edge. The system uses a 10-channel Digital Sound Processor to control and equalise each speaker, ensuring an even sound distribution throughout the cabin. A surround sound option delivers an even more enveloping audio experience. The new Edge also offers a new fully configurable 3D digital instrument cluster that allows you to personalise the layout of the speedometer, rev-counter and vehicle information displays to suit their own preferences.